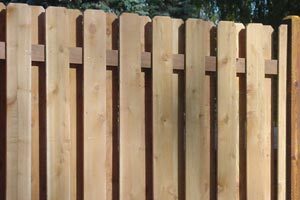 How Much a Western Red Cedar Wood Fence Costs? Save on Red Cedar Wood Fence of $3,000 or more. 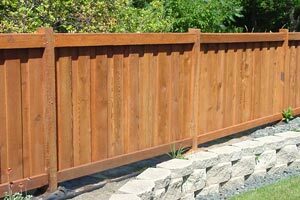 Less than $19.00 per foot, 72″ red cedar privacy fence. 100 feet of materials, Board-Next-to-Board design, with 1 gate included. What is the size of the fence? Both materials and installation are priced by the linear foot. The longer the overall fence, regardless of materials, the higher the price. In our free on-site consultations, we take careful measurements. For DIY materials lists, we need a dimensioned sketch to determine the size of the project. Exactly what materials will be used? – For red cedar wood, the type of fence you are planning makes a difference. Pricing for picket fences is different from the cost of a privacy or semi-privacy fence. Picket and fence board width, grade and texture, plus post and rail choices affect the cost. How tall will the fence be? – The height determines how many board feet of pickets will be needed, as well as the number of rails that will be needed and the length of posts. Tall fences cost more than short ones, in general, so this information affects the total cost. How many gates do you need, and what widths? 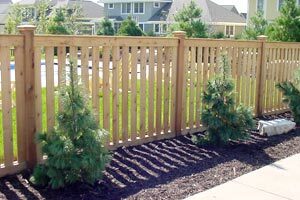 – For most red cedar fences, each gate is built to order, and must be designed for maximum strength. In addition, gate hardware adds to the cost of each gate. Gates are an important factor in the overall cost of the installation. What special features does your project include? – Specially-cut pickets or fence board tops, customized post tops, special finishes, non-standard gate hardware, and many other features can add to the unique nature of your fence and affect cost. Special post installation and materials also add to cost. Is this a DIY project or will you hire us for installation? – If you’re going to build your own fence, the cost of materials and delivery are the primary factors. Add tool rentals and other costs to your total. If you hire us, our cost estimate will be based on installation time and materials. Are there special challenges at your site? – Irregular property grades, challenging soil types, rocky terrain and other site-specific factors can also affect the overall cost of your wood fence when we install it. Our consultant will take these factors into consideration when preparing your price quote. After getting all of the information, we carefully calculate the total cost for your project, based on all factors. We’ll give you an estimate for the total job, and can adjust it during our free consultation based on changes in your choices. Our price quotes are all-inclusive, so you’ll never be surprised by hidden charges and other extras. If situations arise during the installation that will affect the total cost, we’ll discuss them with you, answer your questions, and get your approval before continuing work. If you are building your own fence, your materials list will be complete and include all actual materials and any delivery costs, so you’ll have an accurate cost quote for your project. Our price estimates are always highly competitive with other contractors for identical products. When comparing price quotes, be sure everything is included in competing estimates. 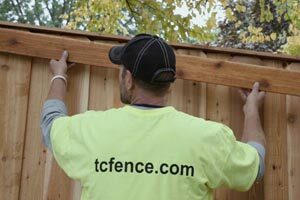 The residential and commercial fencing industry is highly competitive, and property owners in the Twin Cities can choose from among many fence contractors and companies that supply materials. At our company, we’re a high volume purchaser of materials, so we get outstanding wholesale discounts, which we pass on to our customers. We also have the most efficient, experienced and well-trained installation crews anywhere in the area. That means savings on every project and complete satisfaction for our customers. What sets us apart from the rest is our dedication to fair pricing, outstanding quality, and our commitment to building the best fences in the area. Contact us today for a free, no-obligation consultation at your location or visit our showroom to discuss your project. Let us give you a competitive quote on the cost of your Western Red Cedar fence and show you why we’re the fence-builder of choice.